Mountain pine beetles have killed pine trees in forests in North America, and the exact processes of their spread is not fully understood by scientists, hindering our ability to stop the destruction. These beetles can spread rapidly through a forest and are not being killed out seasonally in a warmer climate. Researchers in this study have uncovered new chemical information about the compounds released by mountain pine beetles and how these differ between male and female beetles. Through this they have discovered that the compound trans-verbenol is a key pheromone released by female beetles that works to bring together many beetles to colonize a new tree. Understanding this important colonization hormone could be key in future researchers preventing the ongoing spread of these beetles, which kills acres of trees across our mountains. In this study the researchers used gas chromatography mass spectrometry (GCMS) to separate and distinguish the compounds gathered and produced by beetles. They characterize numerous compounds that the beetles eventually oxidize forming the colonizing pheromone. GCMS works through separating the species in time based on the rate at which they move through a column, then analyzing the compounds for their mass using electron impact to generate ions from the molecules exiting the column, which then have different flight paths based on their different masses. 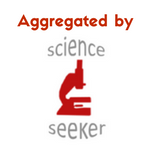 This allows for separation of different species and then analysis of their masses. Researchers can then determine the identity of the compound by combining the knowledge about the time when a compound leaves the separation column as well as its mass. An example GC plot for myrtanyl oleate can be seen in Figure 1, where we can see the time at which that compound left the separation column, and the intensity of the peak corresponds to the amount of that compound in this sample. Figure 1: Analysis of myrtanyl oleate from the GC, where the peak can be seen which corresponds to the amount of that compound present. 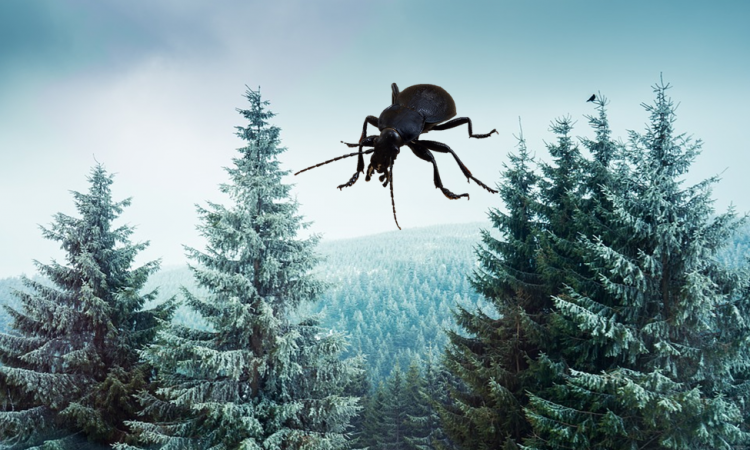 The researchers also found that the monoterpene alpha-pinene that is emitted by trees is oxidized by the beetles while they are colonizing the tree producing trans-verbenol which they release while they are juveniles. The suite of compounds studied were measured in male and female beetles throughout their life cycle, including when they were larva, pupae, and full-grown beetles. 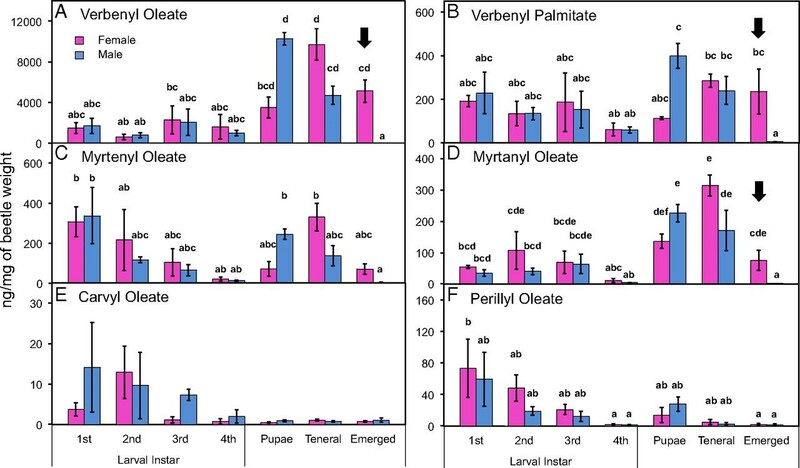 This range can be seen in Figure 2, where the verbenyl oleate, verbenyl palimitate, mytrenyl oleate, and myrtanyl oleate exist in large amounts in the female emerged beetles, but not in the males, and allows the female beetles to produce trans-verbenol to colonize a tree. Figure 2: Amount by weight of each species found in the beetles at different stages of their life. The life stage can be seen at the bottom and the pink represents female beetles while the blue represents male beetles. The results of this study have provided new insight into the mechanism with which these beetles colonize trees through the storage and release of pheromones by the female beetles. A similar mechanism could occur for other destructive beetle species that attack other types of trees across North America and Asia. Understanding these processes could help us to better prevent the spread of the beetles and thus destruction of forests.